Berwick Rangers boss Robbie Horn resigned as manager on Saturday, saying the role was effecting his health and later adding that he “needs a break” from the game. 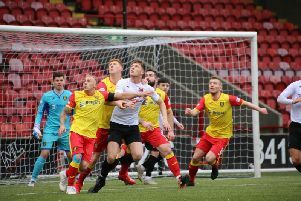 Just a couple of hours after a 3-0 defeat at league leaders Edinburgh City, the club announced that the 41-year-old had handed in his resignation. Horn, who took over as manager last summer, waited until the early hours of Sunday morning to add comment. Speaking to the Berwickshire News after his departure, Horn added: “It’s 100 per cent the right decision. “As a player, as a coach, as an assistant manager and now as a manager, I have given everything I possibly could have to this club. “The last month, it’s been having an effect on my health and when it gets to that stage you have to realise that it’s not worth it anymore. “It was a difficult decision to make because this is my club, and the club I love. Horn, who played for the Wee Rangers for six years, talked about the pride he has as he leaves Shielfield Park and picked out a couple of personal highlights. “It’s been an honour to be the manager of the club that I love. “We had some decent results away at Peterhead, and we turned around a 2-0 deficit to beat Elgin 3-2 at home. “At the start of this season, after all the turmoil over the summer, to win our first league game was nice. Moving forward, Horn admitted he needs a break from football – and he hopes to use the increased free time well. “Sometimes you forget it’s a part-time job. It became like a full-time job on top of another full-time job. “At this moment in time I need to do what is right for me, and that is taking a break from football. “After that I can see where I want to go. Berwick assistant manager David Burrell also departed the club, with H0rn adding: “He seen what it had done to me as a person and felt loyalty to me.